April Cornell - Live Beautiful: Imagine if Everyone Did That.. Imagine if Everyone Did That.. Sometimes you know you are in the right place and doing the right thing. And mostly its because the people around you are doing what you would do if you'd thought of it first. I can say that as a mother, and as a business owner, nothing gives more satisfaction than a child behaving the way my mother taught me, or an employee espousing the same values as me. I am a very lucky person. I work with very talented people and I have awesome sons. They share and complete my vision for an artistic enterprise. But they do more than that - they take it further. The point of being here on this blessed earth is to move it forward, to advance civilization, not diminish it. They complete that circle. They broaden the ripples. So that the ripples catch others, that make new ripples too. Here's the story: Last week my company received a large order from a well-known retailer. The order came through a licensing partner of mine, and it exceeded our expectations. By a lot. We were tres happy, but perhaps not quite as ecstatic as my factory in New Delhi, they would be manufacturing the order! Like a California brush fire the news spread with a snap, a crackle and a shout. People cheered and laughed and joked and - expressed their luck. "We are lucky. With this good fortune - we will to do something." Starting with my Head of Indian Operations, Harpreet Sindhu, an idea took hold. Let's celebrate our new business bounty by giving something to others. Let's pass on our success to somebody else. 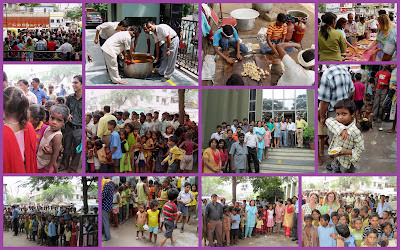 It was decided to hold a food distribution for the poor - believe me, in New Delhi, there is no shortage of people without, there is no shortage of poor, no dearth of the hungry. 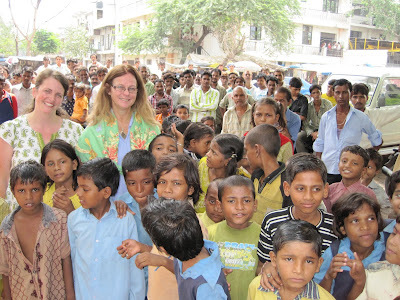 The team at Cornell Overseas dug into their own pocketbooks to give. Harpreet kicked off the giving, the CFO followed suite, then a merchandiser, a production manager, now the IT in charge, more merchandisers, a quality controller, and a sample maker, a children's wear manager, a spec specialist, an artist. Do you know how many hands it takes to make a beautiful tablecloth? To keep a company healthy? Well, they all joined in. Imagine if everybody did that? If everybody met good luck as an opportunity to share? Then you can imagine yesterday, when hundreds of children, men and women massed in front of our factory for lunch. For food. For friendship, for opportunity. In shoulder-to-shoulder and belly- to-belly and arm-to-arm lines. From tiny three year olds, and able bodied but thin young men, lining up for fresh fried puris, and just cooked vegetable curry, and sweet halwa. You would have seen huge vats of food, a mountain of breads, and buckets of sweets, all served in bamboo dishes. Our diners. mere children in every sort of tossed fashion, wearing threadbare clothes made for them or for others. School boys and toddlers, man woman and child, They jostled and laughed and cajoled their way to two puris or four. To lunchtime and more. And my staff was proud to be serving and organizing and spreading their largesse to others. I can only say, I was proud too, proud of them and the children who allowed the generosity. I was proud to stand with them and what they stand for. I like this circle, this circle of commerce, this pattern of outreach, this acknowledgement of good fortune. Now, you see why I am lucky - it's the peeople, that's why. Feel Beautiful, Be Beautiful, Live Beautiful, people. what a wonderful story - thank you for sharing! Hi April,is'nt it awesome that we have the oppurtunity and the ideas to give back?I was very moved myself by this experiance of giving and distributing...I often feel that many of us lead such secure and protected lives,but people outside are experiancing so much ...Thanks fr letting so many people know....Harpreet.